This Sunday I finished hike number 31/52 for the 52 Hike Challenge in 2015. 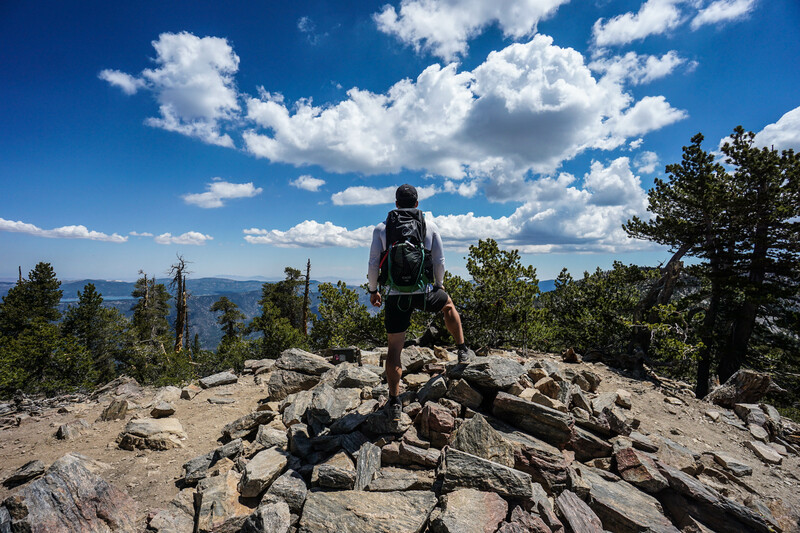 For this day hike, Julia and I made our way out to Angelus Oaks to reach the summit San Bernardino Peak. San Bernardino Peak sits at 10,649 ft, and is reached via a 16.5 mile round-trip hike gaining 4700 ft.
From the trailhead, this one starts climbing a series of switchbacks that gain with a quickness. After 3 miles of uphill, the trail levels off a bit and heads along a ridge towards San Bernardino Peak and Mt. San Gorgonio. This is a great hike for summer months, as there is a lot of shaded areas with only a few sections of prolonged exposure. After about five miles of hiking, the trail starts to climb again and begins to offer beautiful views to the north. To the east, views of Big Bear Lake glimmered in the distance just as huge puffy clouds started to from and blow in from the Southern horizon. Just before reaching the summit, we came across the Washington Monument. Colonel Henry Washington and an army survey team established this monument as a survey point for Southern California. It’s nothing but an old plaque and a pile of rocks, but the viewpoint does offer a great panorama of the area. After leaving Washington Monuments, the trail levels out before a final short lung bursting climb to the San Bernardino Peak. From the summit, we could see San Jacinto and San Gorgonio, both with a halo of clouds. Thanks, Maaike! Very cool to hear that there is a San Bernardino pass in Switzerland! Loving the views in this hike!